Carl loved animals. I didn’t think anyone could love animals more than me, but he might have had me beat. He had a gentle heart and wanted to rescue everyone and everything. In nearly every single photo taken of Carl during the course of his life he’s either holding an animal, a baby or a guitar. He wasn’t afraid of the camera and in all of those photos he is wearing a bright and beaming smile. He held nothing back. Sitting around the Bratlien family’s kitchen table, I’ve loved going through all the family photos. I feel like I’ve known him his entire life even though, technically, I didn’t meet him until I was 25 when he came out to generously help put the roof on my house. He was a friend of a friend. It took us 15 years to become a couple because, as Carl and I often acknowledged, life was doing its (sometimes brutal) work on us, hammering us into shape to become a perfect fit for one another. A couple day’s after Carl’s death, we traveled to his home in North Dakota to tend to the details of his life out west. Carl’s mom, me, and Carl’s extra “dad” (an old family friend of both Carl’s and mine). The three of us were a good team. We were at the height of shocked grief and, honestly, I don’t know how we did it. But we had each other and I think making that journey is what each of us needed, each in our own way. Upon arrival, we were met by a handful of Carl’s employees and friends–some of the most deep-hearted people I have ever met. Together, we worked. We leaned on each other. We told stories. We survived. Janet and Chuck got two rooms in town. I stayed at the house out on the farm where Carl lived. I couldn’t bear to leave Carl’s environment for barely a minute. It worked out well. It gave me much needed time alone and a chance to get to know the guys and to walk around the house in Carl’s slippers, the ones he loved so much because they belonged to his dad who unexpectedly passed away just the year before. His slippers fit like boats on my feet, keeping me afloat, and yet somehow fitting perfectly, all at the same time. I saturated myself in the smell of his clothes and blankets. Really, it was the only breathing I did in that whole first week. But there was something that took my breath away. The cats. Upon waking, I went to let Henry (Carl’s dog) out, but was met by a horde of meowing and soft paws scratching, a velvety movement outside the frosted door. I have never felt such a sense of wonder and love in my entire life. To finally meet Carl’s cats, the feral cat kingdom that he had been taking care of, feeding, and trying to tame these past many months…there they were. He was trying to tame them so he could get them fixed, find homes or simply help them survive the elements. There were cats of all sizes and ages. Some just tiny bumbling kittens, some older with crooked ears and keen eyes, plus everything in between. Sometimes Carl would call me and he wouldn’t even say hello. Instead, he’d excitedly launch into telling me about Sarah or Mathilde or Lucky or whatever stray cat he had gotten to crawl into his arms that day. He named them all. Never mind that he was allergic to cats. He couldn’t help himself; he couldn’t help but love them. He somehow managed to get all his employees, a bunch of guys, to join in on this cat-loving project, too. Carl was an animal and kid magnet of the most extreme kind and so taming a herd of feral cats came easily to him. At first the cats would be scared of him, but he took his time. Next thing you know, they’d be purring like engines, tucked in the folds of his jacket or nestled in his lap. Carl, this huge guy with the most tender heart I’ve ever met. When they packed up all of Carl’s guitar equipment, the cats jumped in, too. I think they were prepared to follow us all the way back to Minnesota. 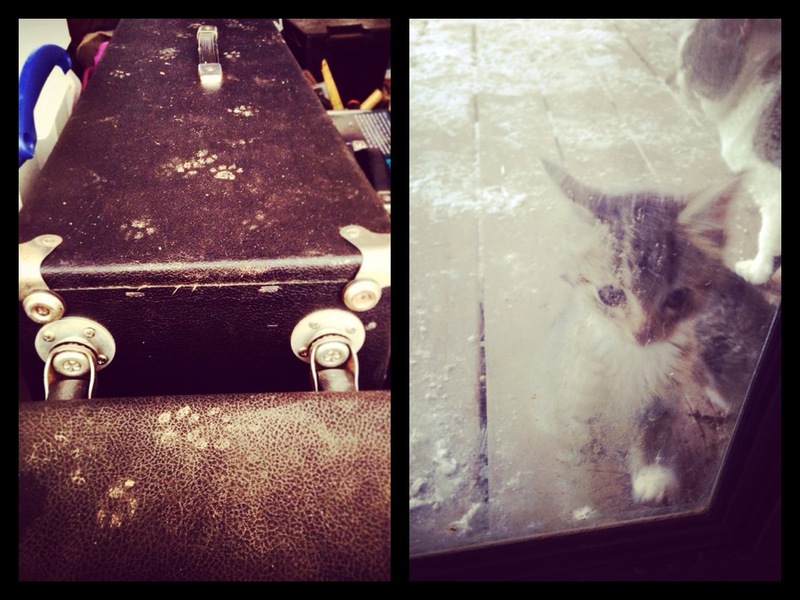 I had to smile the next morning when I saw all the cat tracks on Carl’s amps. Those cats LOVED him! A perfect detail added to Carl’s music obsessed heart. The day that Carl died, we all gathered at his mom’s house. The day is a blur, the grief incomprehensible. But there are couple of good things that happened that day that stick in my memory. One was the pileated woodpecker that showed up outside the dining room window, where we were all sitting. The woodpecker sat there for a long time and stared in at all of us. I laughed and said, “Leave it to Carl to show up as a woodpecker!” Some people get a sign from the beyond in the form of eagles or hawks or some other noble creature. Our lovable, joking woodsman, Carl, showed up as a funny looking bird! Carl, the logger, a bird of the woods. It was a moment of laughter because it was so “Carl.” I’m quite certain that he laughed along with us. The other thing that happened at the time of Carl’s passing is that a stray cat showed up on Janet’s doorstep that very same day. It made itself known in a very big way…begging for attention and fried chicken and banana bread. Oh, Carl!! I have to admit, I am smiling and giggling a bit even as I write this. Carl’s 3 year old niece, Barbara, has appropriately named the cat “Meow.” That cat is on a mission to make itself known! Meow, meow, meow…it weaves around our legs as we walk, it jumps on the sleds with the kids, it runs your way as soon as you arrive and tries to go with you when you leave. The other night, as I was walking to my car to go home, Meow stuck like glue to my feet so that I could barely walk. I said to the night, “Ok, Carl, I hear you! We will take good care of this cat!” smile emoticon I picked him up and snuggled him in my jacket, an instant purring machine. But I can’t bring him home with me because I already have one cat and Henry is not at all cat-friendly. Janet can’t keep him because she has two cats and Carl’s stray is simply too forward for them. We’re looking for a GOOD home for Meow. It’s Carl’s spirit cat and I’m sure whoever he ends up with will be meant to be. Meow is a male who seems happy enough to be an outdoor cat, but might also REALLY love to come inside. He loves kids. And I’m quite certain he’ll love YOU. He has a big personality and so, if you have other pets, they would need to be ok with that. We also think Meow might be part dog. Yes, he’s that kind of cat. Carl won’t let us ignore this one. And anyway…we don’t want to either. We love you, Carl. We love your tender heart and the way it continues to show up. Always and forever. Posted on March 21, 2015 March 23, 2015 by jessiemarianiello	This entry was posted in faith, grief and tagged cats, faith, grief, love. Bookmark the permalink.